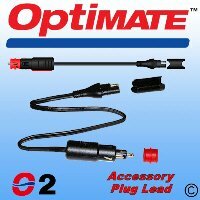 Accessory Plug Lead to connect OptiMate Battery Chargers to cigarette lighter sockets or motorcycle power outlet sockets. New improved SAE-compatible connection lead. This new accessory plug lead for use with SAE OptiMates allows connection to standard car cigarette lighter sockets and also to small accessory sockets fitted to some BMW, Ducati, Honda & Triumph motorcycles by removing the detachable red sleeve. It also fits the matching SAE76 & SAE78 accessory plug sockets. It allows easy connection of an OptiMate to a car's cigarette lighter socket or a motorcycle's accessory socket. It is of particular use for any other vehicles where use of the standard fused permanent lead is not practical for any reason. Note - before ordering, please check that your cigarette lighter is live when the ignition is OFF. The accessory plug lead is wired for NEGATIVE EARTH vehicles - if you have a positive earth vehicle, it is necessary to rewire the plug accordingly - this is a simple job as screw terminals are used. This new SAE compatible lead is supplied with a detachable rubber sleeve to form weatherproof joints with other OptiMate SAE accessory leads. "Just a quick note to say a huge thanks for the prompt service and next-day delivery of my CG Lock, I was able to put it to good use at another trip to the Nurburgring in Germany."